Lung cancer starts in the cells of the lung, which is an organ in the chest. 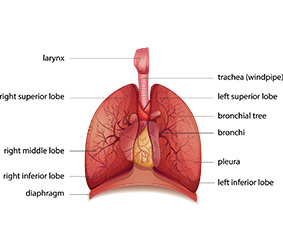 The lungs take in oxygen from the air and release carbon dioxide from the body. To learn more about lung cancer, visit the Canadian Cancer Society. You will also find links to other organizations that provide information related to lung cancer. The more you smoke and the longer you smoke, the greater your risk is for lung cancer. Smoking is linked to many types of cancer and other diseases. There is no safe kind of tobacco product and no safe amount of smoking. It’s never too late to benefit from becoming smoke-free. If you are already a non-smoker, keep yourself safe by avoiding exposure to other people’s tobacco smoke (second-hand smoke). It may take several tries to quit smoking. If you’ve tried to quit in the past and have started smoking again, don’t give up. Each time you try to quit, you get closer to your goal of being smoke-free forever. Radon gas, a colourless, odourless, naturally occurring gas that can be a health risk if it builds up in a home or building. Visit Health Canada to find out what to do if you are concerned about radon gas in your home. Asbestos, a type of minerals used in some products like brake pads and cement. It can become harmful when disturbed or damaged, releasing fibres into the air, such as during a renovation. Visit Government of Canada to learn more about asbestos, its health risks and how to avoid exposure. If you work in certain industries, you may be exposed to metals, dust, fibres, asbestos, arsenic, radiation, gases or other compounds that may increase the risk of lung cancer. Exposure to cancer-causing substances can also vary based on how close you work to these substances. For instance, it depends on how long you’ve worked there, the exposure controls in place, and whether you’ve been using protective clothing and devices such as respirators and gloves. To protect yourself, talk to your supervisor, health or safety specialist, industrial hygienist or local union representative about exposures in your workplace. For more information about causes of lung cancer in the workplace, visit the Occupational Cancer Research Centre’s page on lung cancer. Eating a diet rich in vegetables and, in particular, fruit may help to reduce your risk of lung cancer. The exact reasons are not yet clear. Vegetables and fruit are good sources of beneficial nutrients such as antioxidants, carotenoids and phytochemicals that help to boost the immune system. There is some evidence that having a parent, sibling or child with lung cancer is associated with an increased risk. Some of the risk may be because family members share behaviours, like smoking or being exposed to second-hand smoke. So far, no specific gene has been found for lung cancer. Researchers are still studying whether a genetic mutation for lung cancer can be inherited. In Ontario, lung cancer is the most common cause of cancer death. The reason so many people die of lung cancer is that by the time it causes symptoms, the cancer has usually spread to other parts of the body or is too big for treatment to work. There is now a test, called a “low-dose CT scan,” that can find lung cancer early, when it may be smaller and easier to treat. Since June, 2017, people who are at high risk of getting lung cancer have been able to be screened in a few hospitals across Ontario. This is a pilot that will help plan for a possible province-wide lung cancer screening program. I live near one of the pilot hospitals. How do I find out if I qualify for lung cancer screening? To find out if you qualify, talk to your healthcare provider or call the lung cancer screening hospital closest to you. How do I know if lung cancer screening is right for me? You should only be screened with a low-dose CT scan if you are at high risk of getting lung cancer from smoking cigarettes heavily for many years and you qualify for the Lung Cancer Screening Pilot for People at High Risk. Screening may have more risks than benefits for those who are not at high risk of getting lung cancer. If you have any possible symptoms of lung cancer, speak with your healthcare provider as soon as possible, as screening may not be right for you. Getting screened with a low-dose CT scan is the best way to find lung cancer early. When cancer is found early, it is usually smaller and treatment has a better chance of working. Screening tests are not perfect and can have risks. At your screening appointment, you will get information about the risks and benefits of screening to help you decide whether you want to have a low-dose CT scan. I live far away from a pilot hospital. Is there anything else I can do to lessen my lung cancer risk? Quitting smoking is the best way to lower your chance of getting lung cancer and other diseases. If you stop smoking, you will greatly lower your chance of getting many diseases and dying early. Quitting can be hard, but it is possible and you are more likely to succeed if you get help. You can visit Smokers’ Helpline or call them anytime for support at 1-877-513-5333. During diagnosis, a person may need many tests to confirm the cancer. Waiting for test results to come back can be stressful. Talk to your doctor about managing stress during this difficult time. For more information about diagnostic tests for lung cancer, you can visit the Canadian Cancer Society. Not everyone follows the same diagnostic process. Some patients may be helped through the process by their family doctor, while others may be helped by a specialist or a Diagnostic Assessment Program (DAP). In many cases, a family doctor is the first contact point in the process of diagnosing cancer and is the one to refer a patient to a specialist or DAP. To check if a DAP is available in your area, go to our map of DAP locations. To learn more about types of lung cancer treatment, visit the Canadian Cancer Society. You can learn more about specific cancer drugs using our patient information sheets. These provide information about cancer drug therapies, including what they are used for and how to manage side effects. To find patient information sheets, go to the Drugs page. You can also see About Chemotherapy for general information about cancer drug therapy. It’s never too late to quit smoking. Whether you are scheduled to have surgery, radiation treatment or chemotherapy, quitting smoking can help your treatment work better. It also can reduce the chance of your cancer coming back or getting another form of cancer. For more information and resources, see Benefits of Quitting Smoking for People with Cancer. People with cancer may have symptoms related to their cancer or as a side effect of treatment. The guides are available for patients and for healthcare providers. Each patient guide also comes with links to helpful resources like courses, books, videos and worksheets. Our side effect information sheets offer tips for people going through side effects from chemotherapy treatment. If you are a person with cancer, please remember that it’s important to discuss any symptoms or concerns with your healthcare team. Clinical trials are scientific studies that test the safety and effectiveness of a medical treatment. Find clinical trials in Canada. Palliative care supports people with life-threatening illness and their families. The goal of this care is to relieve suffering so people can have the best possible quality of life. Palliative care should start when a person is diagnosed with a serious illness. To learn more, go to the Palliative Care page. When treatment ends, a person moves into a new phase of their cancer experience. For many patients, a lot of the after-treatment care will be given by healthcare providers in the community, like a family doctor or nurse practitioner. To learn more about follow-up care, visit the Canadian Cancer Society. A person may have symptoms from cancer for months or years after treatment has ended. These are called long-term effects or late effects. If you have ongoing symptoms after being treated for cancer, you can find information on how to manage them in our Symptom and Side Effect Management guides. To better understand the late or long-term effects of cancer treatment, visit the Canadian Cancer Society for a helpful overview. Each person has a different experience during their final months and days of life. Their symptoms may change as their illness continues, and their needs for information and support will be unique. Family members will also have questions, concerns and needs of their own. If you are helping a family member through their final months of life, talk to your healthcare team about your questions and concerns as they come up. They can give you information and resources to support you and your family, and help you make decisions and plan for end-of-life care. For more information, go to the Palliative Care page. In 2013, there were 9,757 cases of lung cancer diagnosed in Ontario, making it the 2nd most common cancer. There were also 6,736 deaths from lung cancer, making it the leading cause of cancer death. One in 13 Ontarians is expected to develop lung cancer in their lifetime and 1 in 16 is expected to die from it. Lung cancer rates have been going up in women since the 1980s, but this trend has slowed since 1995. In men, the rates have remained stable since the late 2000’s. Since the late 1980s, deaths from lung cancer have been going down in men and women, with a faster rate of decline in men compared to women. Women under the age of 50 have higher rates of lung cancer than men under the age of 50. People diagnosed with lung cancer are 20% as likely to survive 5 years after diagnosis compared to similar people in the general population. Learn about your risk of getting lung cancer – Visit My CancerIQ and get a personalized risk assessment and action plan. Speak with a cancer information specialist – Call the Canadian Cancer Society’s Cancer Information Service toll-free in Canada at 1-888-939-3333 or email [email protected]. Find cancer-related services in your area – Use the Canadian Cancer Society’s community services locator. Find regional cancer centre information – Go to Regional Cancer Centres.